American physicist mission specialist astronaut 1994-2003. Perished in Columbia shuttle disintegration during re-entry. Status: Deceased; Active 1994-2003. Born: 1959-12-25. Died: 2003-02-01. Spaceflights: 2 . Total time in space: 24.76 days. Birth Place: New York. Grew up in Spokane, Washington. Educated Washington; Creighton. PERSONAL DATA: Born December 25, 1959, in Plattsburgh, New York, but considered Spokane, Washington, to be his hometown. Died on February 1, 2003 over the southern United States when Space Shuttle Columbia and her crew perished during entry, 16 minutes prior to scheduled landing. He is survived by his wife and children. Michael enjoyed photography, chess, computers, and tennis. Born December 25, 1959, in Plattsburgh, New York. Considers Spokane, Washington, to be his hometown. Married. Enjoys photography, chess, computers, and tennis. Graduated from Cheney High School in Cheney, Washington, in 1977. Bachelor of science degree in physics/astronomy from University of Washington, 1981. Master of science degree in physics from Creighton University, 1990. Distinguished graduate USAF Communication Electronics Officers course. Recipient of the Armed Forces Communication Electronics Associations Academic Excellence Award 1983. Received the USAF Undergraduate Pilot Training Academic Achievement Award for Class 87-08 Vance AFB. Awarded the USAF Meritorious Service Medal, and the USAF Achievement Medal with one oak leaf cluster. Anderson graduated form the University of Washington in 1981 and was commissioned a second lieutenant. After completing a year of technical training at Keesler AFB Mississippi he was assigned to Randolph AFB Texas. At Randolph he served as Chief of Communication Maintenance for the 2015 Communication Squadron and later as Director of Information System Maintenance for the 1920 Information System Group. In 1986 he was selected to attend Undergraduate Pilot Training at Vance AFB, Oklahoma. Upon graduation he was assigned to the 2nd Airborne Command and Control Squadron, Offutt AFB Nebraska as a EC 135 pilot, flying the Strategic Air Commands airborne command post code named "Looking Glass". From January 1991 to September 1992 he served as an aircraft commander and instructor pilot in the 920th Air Refueling Squadron, Wurtsmith AFB Michigan. From September 1992 to February 1995 he was assigned as a instructor pilot and tactics officer in the 380 Air Refueling Wing, Plattsburgh AFB New York. Anderson has logged over 3000 hours in various models of the KC-135 and the T-38A aircraft. Selected by NASA in December 1994, Anderson reported to the Johnson Space Center in March 1995. He completed a year of training and evaluation, and is qualified for flight crew assignment as a mission specialist. Anderson was initially assigned technical duties in the Flight Support Branch of the Astronaut Office. 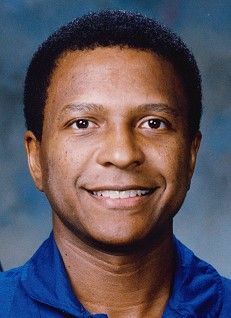 Most recently, he flew on the crew of STS-89. In completing his first space flight Anderson has logged over 211 hours in space. STS-89 (January 22-31, 1998), was the eighth Shuttle-Mir docking mission during which the crew transferred more than 8,000 pounds of scientific equipment, logistical hardware and water from Space Shuttle Endeavour to Mir. In the fifth and last exchange of a U.S. astronaut, STS-89 delivered Andy Thomas to Mir and returned with David Wolf. Mission duration was 8 days, 19 hours and 47 seconds, traveling 3.6 million miles in 138 orbits of the Earth. Family: Astronaut. Country: USA. Spacecraft: Mir. Flights: STS-89, STS-89 Mir NASA-6, STS-107. Projects: STS. Agency: USAF. Bibliography: 12, 5106. 1959 December 25 - . Birth of Michael Phillip Anderson - . Nation: USA. Related Persons: Anderson. American physicist mission specialist astronaut 1994-2003. Perished in Columbia shuttle disintegration during re-entry. 2 spaceflights, 24.8 days in space. Flew to orbit on STS-89 (1998), STS-107..
Death of Michael Philip Anderson. - . Related Persons: Anderson. American physicist mission specialist astronaut 1994-2003. Perished in Columbia shuttle disintegration during re-entry. 2 spaceflights, 24.8 days in space. Flew to orbit on STS-89 (1998), STS-107..